We weren't a superstitious group. It just seemed like a fun thing to do. That's really the reason why in 1973, Mark Miller and I vowed not to shave for the entire soccer season…unless we lost a game. About midway through the semester, we both had a full beard. We were approached by Herb Drinnon, Walsh's first full time theatre director who was casting for the play Becket and needed two medieval, bearded Knights for small roles in the production. Minimal acting experience required. We thought "why not?" and signed on. I always wondered if he regretted that impulse request. I think early on in rehearsals it became very apparent that I had no acting ability and absolutely no dramatic sense of timing. Luckily we didn't lose a game or the only thing I had going for me, the beard, would've been gone too! I only had one line "I'm waiting." But every time it came across flat, late in delivery and with a New Jersey accent. Somehow word spread and we had a packed house with students waiting in anticipation for me to mess up. I don't think Herb was too upset once he saw the crowd enjoying it. He even asked us back for small roles in the spring production of Cat on a Hot Tin Roof! 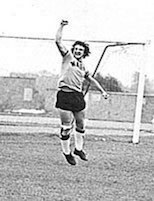 The Walsh Soccer Team was coached by Frank Borroni and at that time, we were the most successful squad in the college's history. After a successful regular season, we captured the NAIA's District 22 Soccer Championship which advanced us to the Area IV NAIA semifinals. It was my senior year and we had made it all the way to the Sweet Sixteen. In the Area IV playoffs, we beat Asbury College (Ky) at home, but lost to Goshen College 2-1 in Goshen Indiana. One poignant memory stands out the most --our return trip back to Walsh from Goshen Indiana, after we lost in the Sweet Sixteen round. We were pulling into the parking lot and there, on the steps of the gymnasium, we saw a huge crowd of students, faculty and staff. All cheering and yelling. Honestly, we all looked at each other and asked "did we miss something? Is there a party happening that we don't know about?" It took us a few minutes to realize all of that fan fare was for us. It really felt like we had accomplished something big not only for each other, but for the whole school. We may have technically lost, but we were welcomed home by our friends, professors and Walsh community, as if we had won the whole thing.